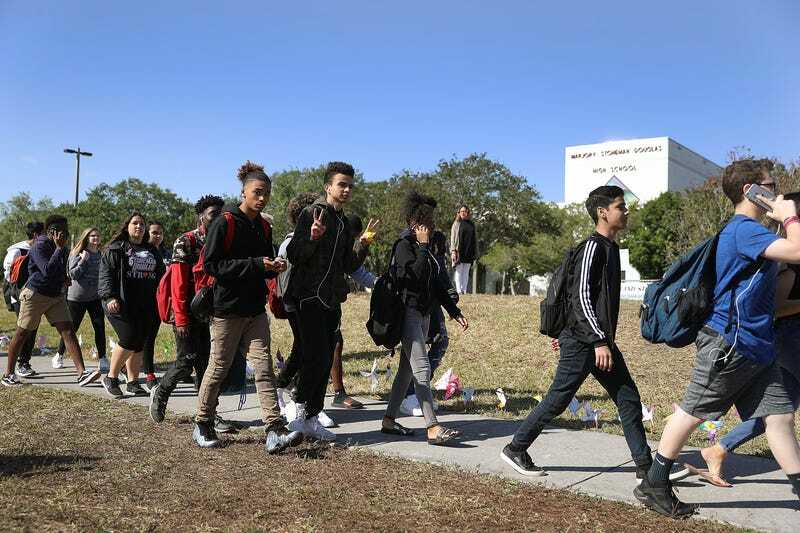 Students from Marjory Stoneman Douglas High School walk out of school March 14, 2018, to honor the memories of the 17 people killed during a mass shooting at the Parkland, Fla., school a month earlier. In the absence of the substantial gun reform advocated by students in Parkland, Fla., their school district will be installing a wholly different security measure: clear backpacks. The Broward County school district announced Wednesday that it would require students at Marjory Stoneman Douglas High School to wear clear backpacks after the students return from spring break, which begins next week. The announcement was made in a letter written by Robert W. Runcie, the superintendent of Broward County Public Schools, which was sent to families of Stoneman Douglas High students. Runcie wrote that students without a clear backpack would be given one for free. Runcie also wrote that all Stoneman Douglas High students would be required to carry identification badges at all times. As the New York Times points out, the security measure is reminiscent of similar regulations at sporting events and airports. Following a school shooting last month that left 17 people at Stoneman Douglas High School dead, there have been a number of incidents that have officials concerned about continuing safety issues at the school. The accused Parkland shooter’s younger brother, Zachary Cruz, was arrested on Monday on trespassing charges after authorities say he skateboarded through the high school because he wanted to “reflect on the school shooting and soak it in.” That same afternoon, an on-campus deputy was found sleeping in his car by a student; the deputy has since been suspended without pay. And on Tuesday, three additional high school students were arrested—two for bringing knives to school, one for making threats on Snapchat. Stoneman Douglas students voiced their skepticism about the new measures on social media. “Great. Because clear backpacks are gonna fix everything. I appreciate the attempt, but I’d rather have common [sense] gun laws than a clear backpack,” Lauren Hogg wrote. “[Shoutout] to America for making my school seem like jail now because legislators don’t have common sense gun reform on their agendas,” tweeted Kyra Parrow, referring to Florida’s new gun-reform measures that fall well short of the assault weapon ban many Parkland students had fiercely advocated for. Other ideas being considered are metal detectors—a move Superintendent Rucie once opposed—which would require administrators to lengthen the school day to allow for the extra time it would take for thousands of students to enter the school, the Sun Sentinel reports.